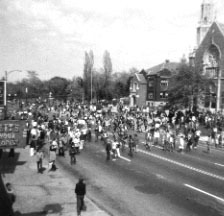 During the Fall 1969 Semester, the students at UB were also clashing with the police over topics such as the Viet Nam War, ROTC on Campus, Project Themis, Race Issues and even over the placement of the New Campus which originally was planned to be downtown by the Waterfront and connected to the Main Street Campus by a future subway. 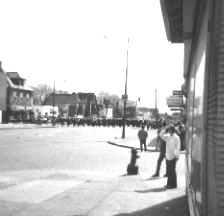 The struggle became more national in nature when we participated by sending buses down to Washington for the national march against our being in Viet Nam, Laos, Cambodia, etc. 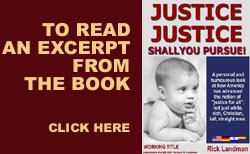 Things came to an abrupt halt in May 1970 after we had one incident of police using rifles and buckshot on campus and then after the killings at Kent State, all things withered away during the summer break of 1970. This was a time when no one was to trust anyone over 30. In retrospect, I want to pay homage and give thanks to those professors/teachers who supported us students. At the time, I wanted to one day be like those white haired adults who had the guts to speak out against the war and other injustices. The photos below were taken by me from the corner of Main and Merrimac. 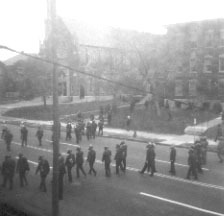 They show the students congregating in the street coming from the lawn in front of what was then Hayes Hall (the Administration Building) and the police lining up at Winspear and then marching up Main Street back on to the campus. 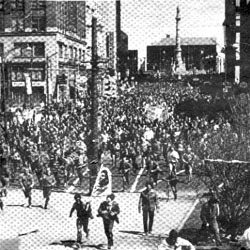 Just tear gas was shot at that time. It was in the Fall Semester of 1969. 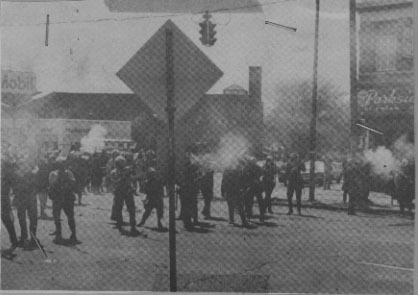 It wasn't until later that the police used buckshot and shot at the students in front of Norton Hall (the Student Union) that was later in early May of 1970. The photos below were from UB's Spectrum Newspaper. 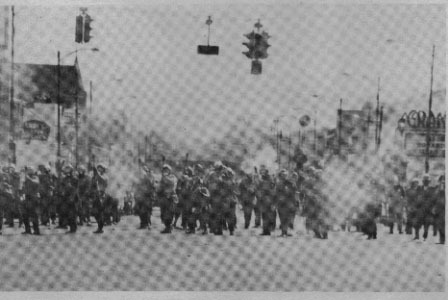 The first shows Downtown Buffalo and the others are taken of the City Police standing near Winspear Avenue, by Parkside Candies, shooting off tear gas. Since my house was a block away, we really got hit badly by all of the gas.